We are once again in full swing planning the Swartland Revolution. After the overwhelming success of the inaugural Revolution, this year promises to be bigger and better. With 250 tickets available there will not only be more guests, but more tastings and more goodies and fun entertainment awaits you, come 11/11/11. This year’s tastings (three, compared to two last year) includes a Friday afternoon tasting by Olivier Clape presenting six of his world class French wines. On Saturday there will be a tasting of eight wines from the local Mullineux Cellar as well as a tasting with wine journalist Jamie Goode (all the way from London) and Michael Fridjhon, a revolution favourite. They will treat us to four of their favourite wines each. As they say, dont fix it if it aint broken; so celeb chef Reuben Riffel will once again be in charge of the braai tongs on Friday night while local hero Mynardt Joubert and the team at Bar Bar Black Sheep will have to pull out all the stops to top their Festival Feast from 2010 for lunch on Saturday. For the entire programme of events, click here! 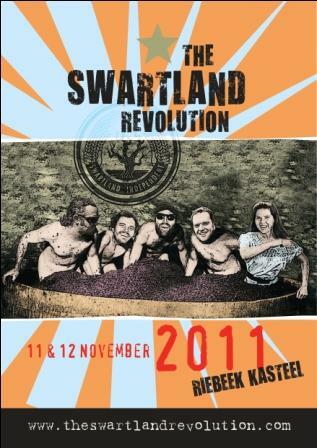 Hope to see you in the Swartland in November! This entry was posted in Adi Badenhorst, Bar Bar Black sheep, eben sadie, jamie goode, malmesbury, mullineux wines, Paardeberg, reuben riffel, Riebeek, South African Wine, swartland, the swartland revolution by quietriotgirl. Bookmark the permalink.